Earning a total of 321.5 points in 2018, Colt Sherrell earns WJGA’s Boys’ Player of the Year. Colt started off the year by finishing in the top-5 of all 3 spring events at the Western, Eastern and Players Opens. 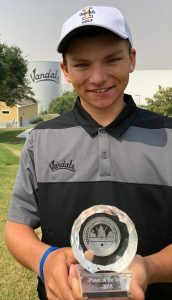 He qualified for the Junior World Championship as a Co-Medalist and was a member of Washington’s Junior Americas Cup team. Colt won the only District 6 Sub-District he played in and captured the title at the District 6 Championship at High Cedars. He finished off his summer with a 4th place finish at the WJGA State Championship. Congratulations Colt on a great season! Brittany Kwon earned a total of 433.5 points during the 2018 season to earn WJGA Girls’ Player of the Year for the third consecutive year. 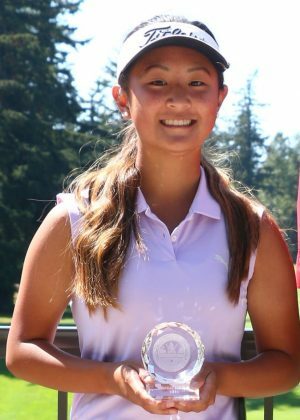 Brittany won both the WJGA Western and Players Opens, qualified for the Junior World Championship where she made the cut and finished in 26th place. She played in her 3rd consecutive Girls’ Junior Americas Cup with a 21st place finish. Brittany also won the District 3 Championship and finished in 2nd place at the WJGA State Championship. Congratulations Brittany on your 3rd consecutive player of the year honor!